Member- International Council for Pre Primary Education. OUR MONTESSORI/NTT COURSES CAN BE DONE BY ANY ONE OF THE FOLLOWING OPTIONS:- 1.ATTENDING CLASSES 2.POSTAL 3.ONLINE. FEES START FROM JUST Rs.17,010/- !!!! FOR DETAILS OF THE POSTAL OR REGULAR CLASSES OPTIONS PLEASE SEND Rs.500/- (can be deducted in the fees)BY CASH/MO/DD FOR THE FULL COLOUR PROSPECTUS. 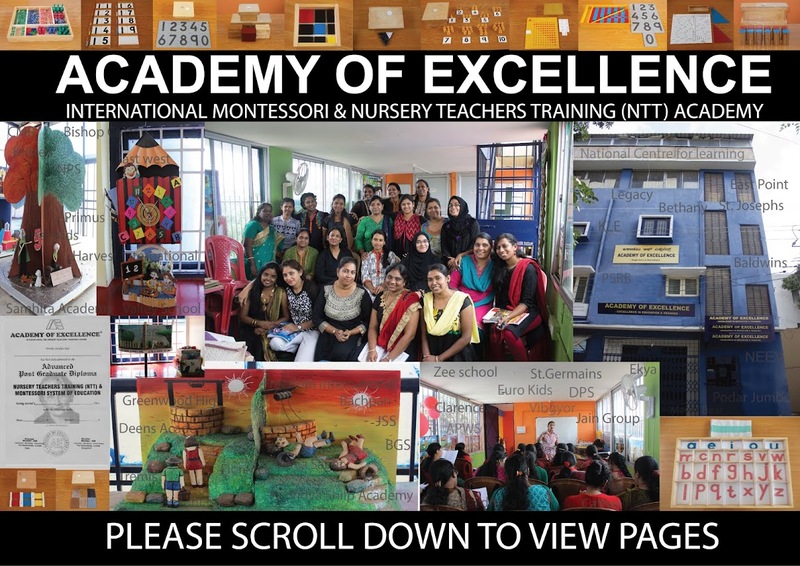 "The only genuine Montessori & NTT institute in Bangalore. Join here if you want more than just a certificate.This academy is known for quality,depth & discipline." OUR COURSES ARE VERY BUDGET FRIENDLY AND START FROM JUST Rs.17,010/- !! WE OFFER 100% PLACEMENT ASSISTANCE TO ALL OUR STUDENTS !! OUR COURSES ARE GLOBALLY VALID !! OUR ALUMNI (ex students) WORK IN SEVERAL COUNTRIES ACROSS THE WORLD !! Academy of Excellence. Awesome Inc. theme. Powered by Blogger.